- Any -Alba M.D.Alcalá M.D.Ayala R.Barranco A.Becerro A.I.Benítez J.J.Borrás A.I.Bravo A.Caballero A.Calvo M.E.Castro M.A.Centeno M.A.Clauss C.Colón G.Cotrino J.Criado J.M.De Arellano-López A.R.Diánez M.J.Díaz-Cuenca A.Dominguez M.I.Espinós J.P.Fernández-Camacho A.Galisteo-Lopez J.F.Gómez D.González-Elipe A.R.Gotor F.J.Hidalgo M.C.Holgado J.P.Ivanova S.Jiménez-Melendo M.Justo A.Lambert R.M.Lozano G.Macías M.Malet P.Martínez-Fernández J.Míguez H.Muñoz-Páez A.Munuera G.Navío J.A.Nuñez N.O.Ocaña M.Odriozola J.A.Palmero A.Penkova A.Pérez-Maqueda L.A.Pérez-Rodríguez J.L.Poyato J.Poyato R.Ramirez-Rico J.Real C.Rojas C.Romero-Sarria F.Sanchez-Jimenez PESánchez-López J.C.Sánchez-Soto P.J.Sayagués M.J.Yubero F.
ZnO was synthesized by a precipitation procedure, free of template agent, by mixing aqueous solutions of Zn (OAc)(2) and dissolved Na2CO3 at pH ca. 7. This material was calcined at different temperatures (200-600 degrees C for 2 h). In two other alternative procedures, after the precipitation, the suspension was taken to hydrothermal treatments or to microwave treatments, subjecting them to calcination treatments at the same temperatures as the previous material. All materials were characterized using various techniques. The photocatalytic activity was assessed in the degradation of methyl orange and phenol using UV-illumination and evaluating the corresponding percentages of conversion and mineralization. A minimal difference between the relative intensities of the exposed faces (I100I002) related to XRD for the synthesized samples seems to be an important factor in obtaining good photocatalytic properties. This minimum, was achieved with a calcination treatment at 400 degrees C for 2 h. With this calcination treatment, no significant variations were observed in the photocatalytic activities of ZnO obtained by the three procedures, although in all cases the zinc oxides obtained exhibited, for each substrate, higher UV-photocatalytic activities than those obtained with TiO2 (P25) used as a reference catalyst. In all cases, the samples showed no photocatalytic activity in the visible region of the spectrum. In this work, we prepared SiC-supported Pt-Cu thin films by magnetron sputtering for use as catalysts for the combustion of hydrogen under oxidizing conditions. We tested the catalysts as prepared and after chemical dealloying. A methodology is presented to fabricate catalytic thin films of a desired composition with tailored magnetron targets with lower Pt consumption. The deposition gas was changed to prepare columnar (Ar-deposited) and closed-porous (He-deposited) films to study the effect of the microstructure on the activity. The effect of composition was also studied for the columnar samples. The as-prepared Pt-Cu thin films showed significant activity only at temperatures higher than 100 °C. Dealloying permitted an increase in the activity to achieve near room-temperature activity. The dealloyed closed-porous He-deposited sample was the most active, being able to convert as much as 13.15 LH2·min−1 gPt−1 at 70 °C (Ea = 1 kJ mol−1). This sample was preferentially dealloyed on the surface, yielding an almost pure Pt shell (96% at. Pt) and a Cu-depleted interior (71% at. Pt). This compositional inhomogeneity enabled the sample to achieve enhanced activity compared to the Ar-deposited columnar sample (with similar initial composition, but uniformly dealloyed), probably due to the compressive surface lattice strain. The dealloyed closed-porous He-deposited sample was shown to be durable over five cycles. 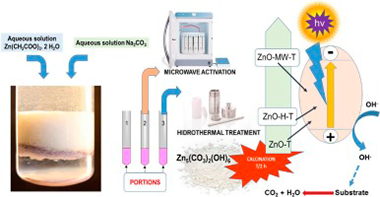 Active and selective structured RuO2/Al2O3 catalysts for CO methanation using a flow simulating CO2-rich reformate gases from WGS and PROX units (H-2 excess, CO2 presence and 300 ppm CO concentration) were prepared. Both, the RuO2/Al2O3 powder and the slurry prepared from it for its structuration by washcoating of the metallic micromonolithic structure, were also active and selective. Both the slurry (S-RuAl) and micro monoliths (M-RuAl) were able to completely and selectively methanate CO at much lower temperatures than the parent RuAI powder. The optimal working temperature in which the CO conversion is maximum and the CO2 conversion is minimized was determined to be from 149 degrees C to 239 degrees C for S-RuAl and from 165 degrees C to 232 degrees C for M-RuAl, whilst it was from 217 degrees C to 226 degrees C for RuAI powder. TPR, XRD and TEM measurements confirmed that the changes in the activity and selectivity for CO methanation among the considered catalysts can be related with modifications in the surface particle size of ruthenium and its reducibility. 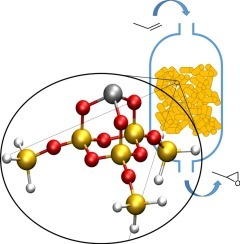 These were ascribed to the metallic substrate, the presence of PVA and colloidal alumina in the slurry preparation, the aqueous and acidic media and the thermal treatment used, resulting in a more active and selective catalysts than the parent powder. In this work, we demonstrate a synthetic route to attain methylammonium lead bromide (CH3NH3PbBr3) perovskite nanocrystals (nc-MAPbBr(3), 1.5 nm < size < 3 nm) and provide them with functionality as highly efficient flexible, transparent, environmentally stable, and adaptable color converting films. We use nanoparticle metal oxide (MOx) thin films as porous scaffolds of controlled nanopores size distribution to synthesize nc-MAPbBr(3) through the infiltration of perovskite liquid precursors. We find that the control over the reaction volume imposed by the nanoporous scaffold gives rise to a strict control of the nanocrystal size, which allows us to observe well-defined quantum confinement effects on the photo-emission, being the luminescence maximum tunable with precision between lambda = 530 nm (green) and lambda = 490 nm (blue). This hybrid nc-MAPbBr(3)/MOx structure presents high mechanical stability and permits subsequent infiltration with an elastomer to achieve a self-standing flexible film, which not only maintains the photo-emission efficiency of the nc-MAPbBr(3) unaltered but also prevents their environmental degradation. Applications as adaptable color-converting layers for light-emitting devices are envisaged and demonstrated. 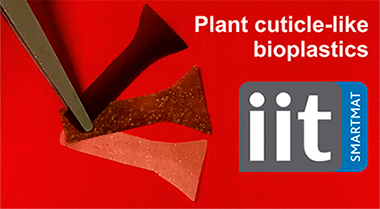 Plant cuticles have been used as models to produce hydrophobic films composed of sodium alginate, the fatty acid fraction of tomato pomace agrowaste, and beeswax. The fabrication process consisted of the blending of components in green solvents (water and ethanol) and a subsequent thermal treatment (150 degrees C, 8 h) to polymerize unsaturated and polyhydroxylated fatty acids from tomato pomace. When sodium alginate and tomato pomace fatty acids were blended, free-standing films were obtained. These films were characterized to evaluate their morphological (SEM), chemical (solid-state NMR, ATR-FTIR), mechanical (tensile tests), thermal (TGA), and hydrodynamic (water contact angle, uptake, and permeability) properties. A comparison between nonpolymerized and polymerized samples was carried out, revealing that the thermal treatment represents a sustainable route to create structured, composite networks of both components. Finally, beeswax was added to the blend with the same amounts of sodium alginate and tomato pomace fatty acids. The presence of the wax improved the hydrophobicity and the mechanical and water barrier properties as well as decreased the water uptake. These results indicate that polymerized plant cuticle-like films have valuable potential for packaging applications. Herein, the preparation of 1D TiO2 nanocolumnar films grown by plasma-enhanced chemical vapor deposition is reported as the electron selective layer (ESL) for perovskite solar devices. The impact of the ESL architecture (1D and 3D morphologies) and the nanocrystalline phase (anatase and amorphous) is analyzed. For anatase structures, similar power conversion efficiencies are achieved using an ESL either the 1D nanocolumns or the classical 3D nanoparticle film. However, lower power conversion efficiencies and different optoelectronic properties are found for perovskite devices based on amorphous 1D films. 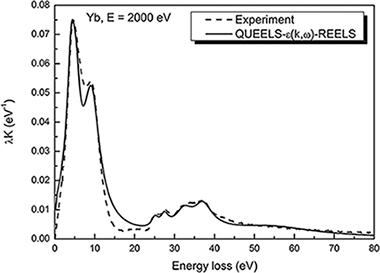 The use of amorphous TiO2 as electron selective contact produces a bump in the reverse scan of the current-voltage curve as well as an additional electronic signal, detected by impedance spectroscopy measurements. The dependence of this additional signal on the optical excitation wavelength used in the IS experiments suggests that it stems from an interfacial process. Calculations using a drift-diffusion model which explicitly considers the selective contacts reproduces qualitatively the main features observed experimentally. These results demonstrate that for a solar cell in which the contact is working properly the open-circuit photovoltage is mainly determined by bulk recombination, whereas the introduction of a "bad contact" shifts the balance to surface recombination. Plasma treatments had emerged as a useful technique to improve seed germination. In this work we investigate the influence of different irrigation conditions and plasma treatments on the germination of nasturtium seeds. During plasma treatment, seeds experience a progressive weight loss as a function of treatment time that has been associated to water release, a process that is more pronounced after longer plasma treatment times. Seeds treated for short times (<30 s) are able to germinate more efficiently than untreated specimen under hydric stress (drought conditions), while plasma treatments for longer times (up to 300 s) impaired germination independently on irrigation conditions. 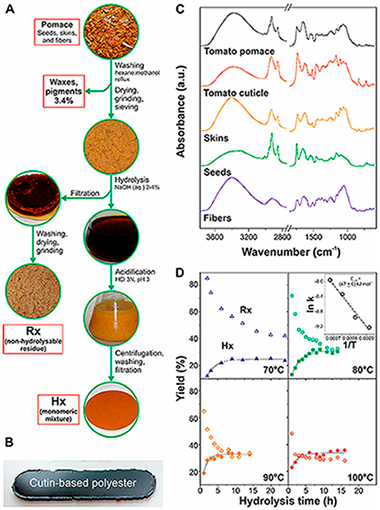 Characterization analysis of plasma treated seeds by FTIR-ATR, SEM/EDX and XPS showed that plasma treatment affected the chemical state of pericarp while, simultaneously, induced a considerable increase in the seeds water uptake capacity. The decrease in germination efficiency found after plasma treatment for long times, or for short times under optimum irrigation conditions, has been attributed to that the excess of water accumulated in the pericarp hampers the diffusion up to the embryo of other agents like oxygen which are deemed essential for germination. Grain growth is a ubiquitous phenomenon in all materials, and it affects both structural and functional properties. Despite its intrinsic importance, a full comprehension of grain growth from a fundamental point of view-i.e., from the nanoscale to the macroscale-is still a pending issue. In practical terms, our knowledge relies on the classical kinetic laws reported sixty years ago. 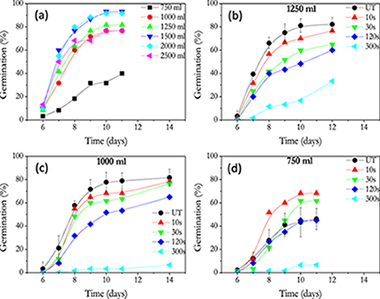 This paper reports the violation of such classical laws in boron carbide ceramics consolidated by spark plasma sintering. The conjunction of high temperature gradients with large compressive stress when a pulse electric current passes through the ceramic powders gives rise to an intense twinning-detwinning formation. These forming steps at the grain boundaries change the grain mobility drastically. Therefore, a new 'exotic' law for grain-growth kinetics is found and validated at different temperatures and dwell times. 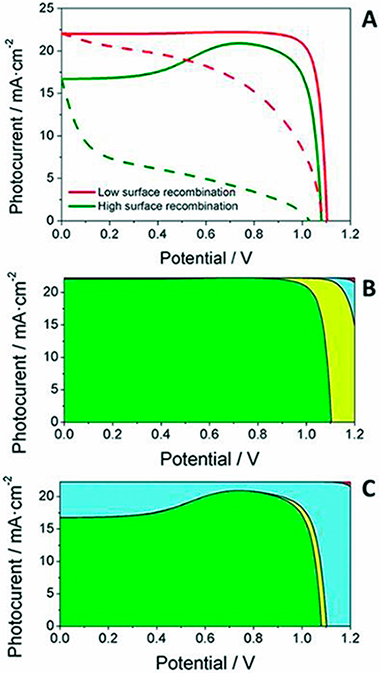 The present paper demonstrates an easy and scalable mechanochemical synthesis of ternary sulfide Cu2SnS3 (CTS) as a promising solar cell absorber. For the synthesis, pre-milled nanoparticles of CuS and SnS were used. The pure CTS phase was readily obtained after 60 min of milling in a laboratory planetary ball mill and 240 min in an industrial eccentric vibration industrial mill, respectively. The reaction progress of laboratory scale synthesis was studied by the quantitative Rietveld analysis. The reaction speed reaches its maximum at 4.6 min and the reaction is completed at approximately 60 min, according to the fitted data. The products of the syntheses were further characterized by X-ray powder diffractometry, Raman spectroscopy, scanning electron microscopy, X-ray photoelectron spectroscopy and UV-Vis spectroscopy. The results revealed formation of near-stoichiometric CTS nanoparticles with tetragonal I-42m symmetry. An average crystallites size of approximately 10-15 nm was determined for CTS phase. The SEM images support quintessential polydisperse character of the powders obtained by ball-milling approach. The materials seem to be suitable for photovoltaic applications with the band-gap energies of approximately 1.16-1.19 eV. A method consisting of the alkaline hydrolysis of tomato pomace by-products has been optimized to obtain a mixture of unsaturated and polyhydroxylated fatty acids as well as a non-hydrolysable secondary residue. Reaction rates and the activation energy of the hydrolysis were calculated to reduce costs associated with chemicals and energy consumption. Lipid and non-hydrolysable fractions were chemically (infrared (IR) spectroscopy, gas chromatography/mass spectrometry (GC-MS)) and thermally (differential scanning calorimetry (DSC), thermogravimetric analysis (TGA)) characterized. In addition, the fatty acid mixture was used to produce cutin-based polyesters. Freestanding films were prepared by non-catalyzed melt-polycondensation and characterized by Attenuated Total Reflected-Fourier Transform Infrared (ATR-FTIR) spectroscopy, solid-state nuclear magnetic resonance (NMR), DSC, TGA, Water Contact Angles (WCA), and tensile tests. These bio-based polymers were hydrophobic, insoluble, infusible, and thermally stable, their physical properties being tunable by controlling the presence of unsaturated fatty acids and oxygen in the reaction. The participation of an oxidative crosslinking side reaction is proposed to be responsible for such modifications. Niobium carbonitride [Nb(C,N)] nanoparticles were synthesized by a combustive mechanochemical reaction in the Mg/Nb2O5/C3H6N6 system. High-energy ball milling was used to promote a mechanically induced self-sustaining reaction (MSR). Combustion occurred after a very short milling period of 5 min. X-ray diffraction (XRD), X-ray photoelectron spectroscopy (XPS), energy-dispersive X-ray spectroscopy (EDS) and electron energy loss spectroscopy (EELS) analyses revealed that the nature of the product is an intermixed carbonitride material. The formation mechanism of Nb(C,N) resulted from the magnesiothermic reduction of niobium oxide to generate elemental Nb, which then reacted with the species generated from the melamine decomposition. A simple, low-cost and environmentally friendly method has been used to obtain highly porous biomorphic carbon monoliths with a good combination of interconnected macro-, meso- and microporosity, and good electrical conductivity and mechanical strength, making these biocarbon materials interesting for electrochemical applications as binder-free electrodes. 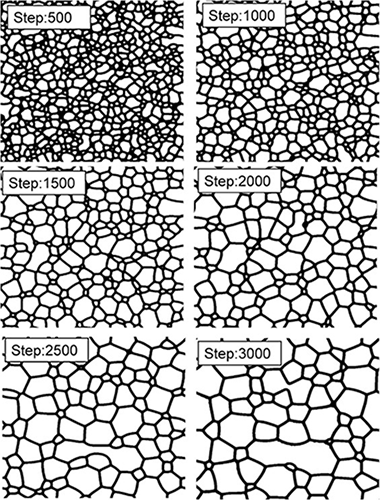 Highly porous monolithic biocarbons were obtained from beech wood precursors through pyrolysis and subsequent surface modification in a steam heated to 970 degrees C with different activation times. The obtained biocarbons demonstrated good electrical conductivity and mechanical strength. They were studied as electrodes for supercapacitors in half cell experiments, demonstrating maximum gravimetric capacitance of 200 F g(-1) in a basic media at scan rate 1 mV s(-1). Galvanostatic charge-discharge experiments showed maximum capacitance of 185 F g(-1) at current density of 0.15 A g(-1) and similar to 100 F g(-1) at current density of 0.75 A g(-1). It has been shown that in addition to the developed porous surface, the micropores with diameters exceeding 1 nm play a key role for the enhanced electrochemical capacity. Long-cycling experiments demonstrated excellent stability of the monolithic biocarbon electrodes with no reduction of the initial capacitance values after 600 cycles in voltammetry. In this study we analyzed the use of high-performance structural concrete reinforced with polypropylene fibers in applications requiring long exposure times to high temperatures, such as thermal energy storage systems. We analyzed the behavior of the concrete at different temperatures (hot tests: 100 degrees C, 300 degrees C, 500 degrees C and 700 degrees C), cooled-down states (cold tests) and exposure times (6, 24, and 48h). We also experimentally determined the thermogravimetric analysis, fracture behavior, compressive strength, Young's modulus, and tensile strength of concrete. Subsequently, we performed a comprehensive analysis of the thermal and mechanical behavior of high-performance concrete under different thermal conditions. We applied longer exposure times to broaden the available results on the behavior of high-performance fiber-reinforced concrete when subjected to high temperatures. Results show that, once thermal and moisture equilibriums are reached, exposure time does not have any influence on mechanical properties. They also provide useful information about the influence of high temperatures on the different parameters of fiber-reinforced concrete and its application for thermal energy storage structures. The measured Yb 4d(3/2) intensity is larger than the Yb 4d(5/2) in X-ray photoelectron (XPS) emission of metallic Yb, which is unexpected. The shape and intensity of photoelectron peaks are strongly affected by extrinsic excitations due to electron transport out of the surface (including bulk and surface effects) and to intrinsic excitations due to the sudden creation of the static core hole. To quantitatively extract from experimental XPS the primary excitation spectrum (ie, the initial excitation process) of the considered transition, these effects must be included within the theoretical description. The combined effect of both extrinsic and intrinsic excitations can be described by an effective energy-differential inelastic electron scattering cross section for XPS evaluated by a dielectric response model with the dielectric function as only input. Then, using this cross section, a direct evaluation of the primary excitation spectrum is performed by standard peak shape analysis for thick homogeneous samples. We use this approach in the present paper to determine the Yb 4d photoemission spectrum for metallic Yb. We show that the unexpected larger intensity of Yb 4d(3/2) compared to 4d(5/2) can be fully accounted for by our model and that the total spectrum consists of a sum of symmetric primary excitation peaks. Catalytic epoxidation of alkenes plays an essential role in the transformation and synthesis of many organic chemicals. Ti atoms grafted on mesoporous silica, silylated on the surface, is considered the most active and selective catalyst for these reactions. However, the durability and robustness of the active centers remain as the main drawback in industry. In this paper, the characterization of industrial samples is combined with DFT calculations to rationalize the deactivation process of the catalyst and improve its performance. Silylating agents are characterized by experimental and simulated 29Si-NMR and their role in the catalytic mechanism is analysed. Potential deactivation processes are identified before, during and after the reaction. Modifications of the silylating agents and of the active center are proposed to improve the durability of the catalyst. 3 mol% yttria tetragonal zirconia polycrystalline (3YTZP) ceramic composite powders with 10 vol% nominal content of graphene nanoplatelets (GNPs) were prepared using four different homogenization routines: dispersion of the powder mixture by ultrasonication in isopropyl alcohol, homogenization in a high-energy planetary ball mill in wet or dry conditions after ultrasonication, and milling of the powders in a high-energy planetary ball mill in dry conditions. 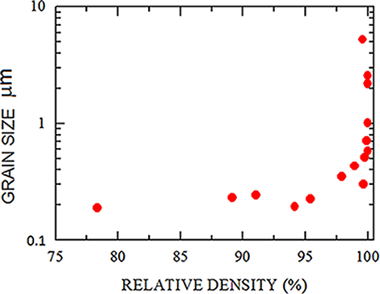 A significant effect of the homogenization routine on the powders particle size distribution was revealed by laser granulometry and Raman spectroscopy. Highly densified composites were obtained after spark plasma sintering (SPS) and remarkable differences on the GNP size, shape and distribution throughout the ceramic matrix and also in the electrical conductivity were observed in the four different composites. The composite with the best performance in terms of electrical conductivity was the one prepared after planetary ball milling of the powders in dry conditions as a consequence of the reduced dimensions of the GNPs and their excellent distribution throughout the ceramic matrix. Tang, Y. Q.; Lopez-Cartes, C.; Aviles, M. A.; Cordoba, J. M.
High energy planetary ball milling has been used to synthesize pseudo-cubic highly-pure LaGaO3 in one hour from its oxide components in an air atmosphere. Calcination at different temperatures led to the crystallization of lanthanum gallate in an orthorhombic structure with its local lanthanum coordination number environment changing from 12 to 7 when the temperature was increased. This change was attributed to the thermal expansion of the Ga-O bonds that varied non-monotonically inducing GaO6 tilting. Rietveld analysis, Raman spectroscopy, and transmission electron microscopy were used to elucidate the LaGaO3 structures at different temperatures. 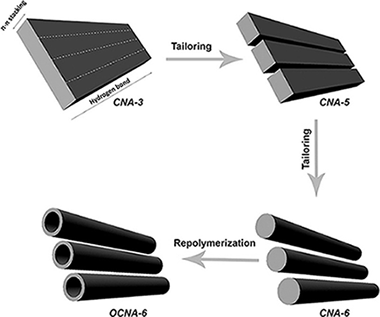 The effect of single walled carbon nanotubes (SWNT) at zirconia grain boundaries on the stability of a tetragonal zirconia polycrystalline matrix has been explored in as-sintered composites and after low temperature hydro thermal degradation (LTD) experiments. For this purpose, highly-dense 3 mol% Y2O3-doped tetragonal zirconia polycrystalline (3YTZP) ceramics and SWNT/3YTZP composites were prepared by spark plasma sintering (SPS). Quantitative X-ray diffraction analysis and microstructural observations point out that an increasing amount of well-dispersed SWNT bundles surrounding zirconia grains decreases the metastable tetragonal phase retention in the ceramic matrix after sintering. In contrast, the tetragonal ceramic grains in composites with SWNTs are less sensitive to the presence of water, i.e. to undergo a martensitic transformation under LTD conditions, than monolithic 3YTZP ceramics. The SWNT incorporation diminishes micro-cracking due to tetragonal to monoclinic ZrO2 phase transformation in the composites. The sintering of fine-grained a-alumina by spark plasma sintering (SPS) was performed to study grain growth under SPS conditions. Grain growth is found to be extensive at relative densities above 95%. A grain growth versus dwell time analysis during SPS allows for the determination of the grain-boundary diffusion coefficient. 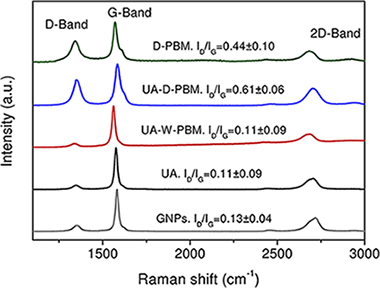 This study shows that the remarkable enhancement of grain-boundary diffusion derived from a previous analysis could be a consequence of the presence of the recently discovered "disconnections" at the grain boundaries of alpha-alumina. Their presence, together with their electric charge and the external electric field at the boundaries, are the key ingredients for a violation of the typical grain growth kinetic law. When they are introduced appropriately, an updated value of the grain-boundary diffusion coefficient is achieved. A comparison with other values reported previously in the literature through other techniques and a critical analysis are also carried out. Nanolayered CrAIN and CrAIYN/CrAIN (average contents of Al approximate to 25 at.% and Y approximate to 1.6 at. %) coatings are deposited on M2 and 316 steel substrates and heated to 1000 degrees C in air for 2 h to study their oxidation mechanism, the thermal stability and the reactive element (RE) effect of yttrium. CrAIN on M2 develops a Cr2O3/Al2O3 passivation layer that preserves in high degree the fcc-CrAIN structure however iron ions leave the substrate and travel to the surface along the column boundaries. The CrAIYN/CrAIN coatings deposited on steels are not stable at 1000 degrees C, and the initial fcc-CrAIN phase is partially transformed to hcp-Al(O)N and Cr-Fe phases (M2) and Cr2N and Al2O3 (316). The addition of Y changes the predominant scale growth direction. Inward oxygen diffusion becomes dominant but a reduction of the oxide scale thickness as compared to CrAIN is not observed. 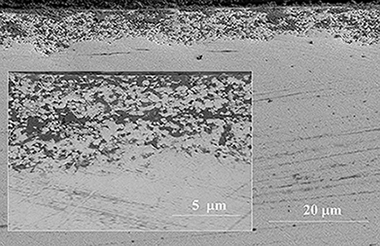 The advanced microstructural analysis made by transmission electron microscopy combined with electron energy loss spectroscopy determined that yttrium migrates mainly to the oxide scale (forming mixed oxides with substrate elements - V and Mo, either as dispersed particles or segregated at the grain boundaries) in M2, and to the oxide interface and column boundaries (forming Al-Y oxides and YN, respectively) in 316 steel. The benefits of addition of Y in improving the oxidation resistance are discussed comparatively with literature data. The RE effect of yttrium is thus observed to be dependent on the substrate, film architecture and composition.